We stopped at Tain Pottery just because it was there. What an accommodating place! The showroom displays patterns and finished items, but they also have a page with all the shapes and sizes they make, and another with all their patterns. You can order any shape and size in any pattern. They’ll make anything not on the list as well. In addition, visitors are welcome to wander through the production area. It was Monday, and no one was decorating, but one kiln was running and another was still warm. One man explained that he was placing overly damp pieces in the kiln to dry them a bit more in the residual heat before they were fired. 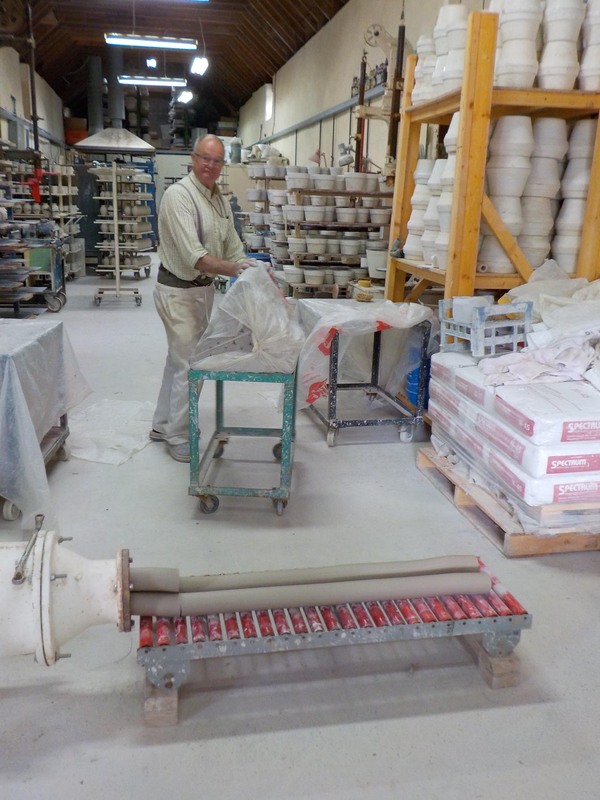 The man in the photo was producing giant snakes of pottery clay. I wondered how he put up with such a boring job. I asked him a couple of questions and discovered (oops) that he was the potter and was preparing his clay on this Monday that he would be throwing into a variety of shapes during the rest of the week. First hand quality control. Since our visit, I’ve seen Tain pottery in several places. Today I went in a restroom in a visitors center in Lairg and saw a large plate of potpourri on the counter. Around the edge of the plate was the inscription “The Highland Council–Loo of the Year 2009”. It looked familiar somehow, so I pushed aside the potpourri to see the decoration on the plate and I found the distinctive tartan and thistle pattern of the Tain pottery. That’s always the problem, how to cart home the treasure.